It’s been another busy year for the biobased chemicals and fuels team at NNFCC; as 2015 draws to a close we take a look at some of the year’s highlights. NNFCC, based in York, is one of the leading European biobased consultancy firms. With their kind permission we re-publish their 2015 review. By Adrian Higson and J. Tomkinson. The continued collapse of the oil price, now below $ 40/bbl has cast a long shadow over not just the biobased industries but across the renewable industry as a whole. However the recently announced climate change deal in Paris brings hope of a silver lining that the necessary development and roll out of renewable technologies will continue and indeed gather pace. The effects of oil price fluctuations are most keenly felt by the fuels and chemical industries and whilst not immune from decreasing oil prices, global mandates and obligations provide a protected market for biofuels, at least in the short to medium term. The biobased chemicals market on the other hand relies on the ability to develop better products, reduce production costs and tap into consumer desires for green purchasing. 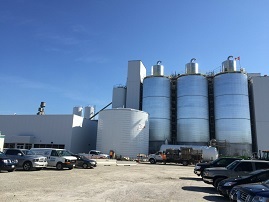 The cellulosic ethanol capacity race ratcheted up another notch with the opening in October of DuPont’s $ 225 million plant in Nevada, Iowa. The plant which converts corn stover (corn cobs, leaves and stalks) has an annual capacity of 30 million gallons of fuel-grade ethanol. In Europe the policy debate, if not the scientific debate, on indirect land use change was finally laid to rest with the finalisation of the so called ‘ILUC file’. In order to negate fears that increasing consumption of food based biofuel could lead to unwanted land use changes, the European Parliament amended the Renewable Energy Directive to limit the use of biofuel produced from crops grown on agricultural land to a maximum of 7%. The ILUC file points to a European desire to move away from first generation biofuels and increase the consumption of advanced biofuels. The new cap means European member states will need to rethink policy measures to increase the consumption of waste based or advanced biofuels, especially if they intend to implement an even lower cap as suggested by some member states. The need to speed up the development of advance biofuel technology was clearly recognised in the UK where £ 25 million was awarded to three companies to support the demonstration of new technology. Celtic Renewables, based in Edinburgh, were awarded £ 11 million to fund a new plant to make biofuels from Scotch whisky by-products. A further £ 11 million was awarded to Advanced Plasma Power, in Swindon, to support the development of biofuels from household waste. Finally, Nova Pangaea Technologies Ltd, based in Tees Valley, received £ 3 million to demonstrate a process for producing biofuels from forestry waste. While it is certainly true that the commercialisation of biobased products is more challenging in a low oil price world, many of the value propositions for biobased products still remain and the industry continues to grow. The environmental awareness of the consumer continues to grow, placing an onus on brands to offer functional but price competitive and environmentally friendly products, which sounds like a challenging prospect but for many is key point of market differentiation. This shift has created a new market proposition for many companies within the biobased ingredients and packaging sectors. Throughout 2015 we waited for the publication of the European Commissions delayed Circular Economy Package. Finally published early December, the package promises support for biobased products through issuing guidance and dissemination of best practices on the cascading use of biomass and supporting innovation in the bio-economy. However it will take some time before we see the type and full extent of Europe’s support for biobased products. With regards to commercial development there was no shortage of announcements in 2015. High on the list was the opening of BioAmber’s 30,000 tons/year succinic acid plant in Sarnia, Canada. Succinic acid remains a bell weather molecule for the industrial biotechnology industry and the development of BioAmber along with Reverdia and Succinity will be closely scrutinised. Also this year, GF Biochemicals began production of levulinic acid at their plant in Caserta, Italy. Not only is the plant the largest in the world, but the announcement also raised the profile of the biobased chemical industry through the involvement of the Arsenal Midfielder Matthew Flamini. Flamini and his business partner Pasquale Granata have been funding the development of the company for many years. Commercial biobased butanol production also came a step closer with Green Biologics beginning the retro fit of their Minnesota ethanol plant for n-butanol and acetone production and isobutanol developers Gevo and Butamax settled their long running patents dispute. Elsewhere the trend towards partnerships and joint venture announcements continued with BASF working with Solazyme, Reverdia with Covestro and Genomatica with Braskem to name but a few. The importance of DNA synthesis and synthetic biology in the development of industrial biotechnology processes continues to grow. A trend demonstrated by the announcement in November that US synthetic biology company Ginkgo Bioworks, had agreed to purchase 100 million base pairs of synthetic DNA from Twist Bioscience in order to meet the growing customer demand for engineered organisms. It is notable that synthetic biology pioneer Amyris was able to drive down the cost of farnesene production, an important step in the growth of the company and their long term journey towards aviation fuel production. The UK has backed biotechnology as one mechanism to invigorate its chemical manufacturing industry. To date the UK’s flagship industrial biotechnology research and innovation funding programme the IB Catalyst has awarded £ 58.75 million to biotechnology projects ranging from optimising biopharmaceutical production through to increasing methane output from anaerobic digestion. As IB Catalyst coordinators the NNFCC are proud to be part of such an exciting programme. So what might 2016 hold in store? At NNFCC we’ll be keeping a close watch on the roll out of the EU Circular Economy package and what opportunities this may create for the biobased products industries. Our chemical pick for the year is 2,5-furandicarboxylic acid (FDCA), championed for many years by Dutch developer Avantium as a monomer for PEF polyester production. The FDCA development space looks set to get more interesting with Corbion and a third European producer entering the commercialisation race. For biofuels, the policy driven search for sustainable cost effective advance biofuel technology appears to be the only show in town. For first generational ethanol producers this means that the search for alternative non-food fermentable sugars to replace starch and sucrose becomes increasingly important. Beyond petrol blends, a sustainable advanced biodiesel process outside of hydrogenated vegetable oil appears as elusive as ever. This leaves open the question of how the industry will respond to the need for diesel compatible fuel in road transport and given the low oil prices will the production of aviation biofuel ever take off? Through 2016 NNFCC will continue to track and analyse market and policy developments ensuring our professional team offers up to date and in depth business strategy support to our clients.